Health Nut is here to help you make yours actionable and affordable! Let’s share with one another what helps us get going at the start of the day. Our whole body specialists are on the floor to talk to you about your needs, and our monthly sales flyer exists to give you a little extra incentive to try something new that could lead you to new sparks of vitality and ability. In this month’s flyer, you’ll find a variety of products on sale that we’ve selected with this in mind, but for now we want to give a shoutout to a few favorites: Farmhouse Culture Gut Shots and Miyoko’s Kitchen European Style Cultured Vegan Butter. Made with organic coconut oil, organic cashews, and sea salt, Miyoko’s vegan butter is the same delicious taste, texture, and function as traditional butter, just without the cholesterol, lactose, eggs, gluten, and palm oil that can present issues in many people’s bodies. 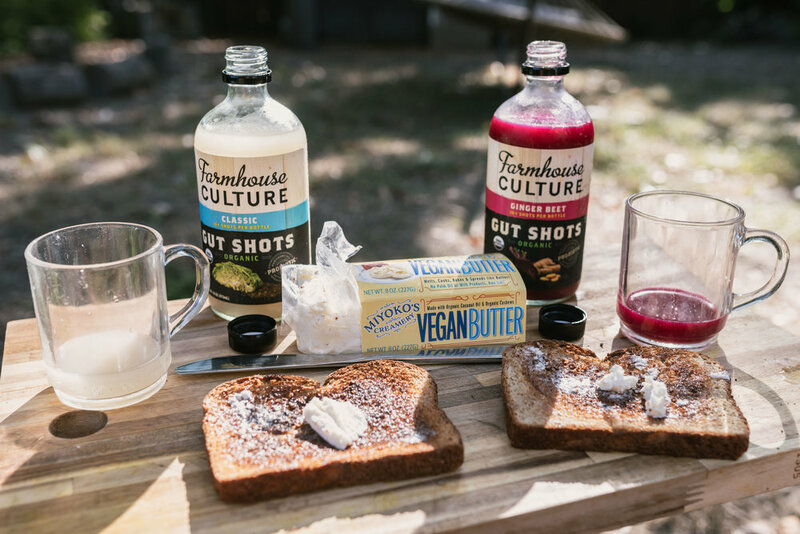 While the vegan butter provides a familiar flavor, the gut shots are likely to be an entirely new experience. Shown in the above photo are the ginger beet and classic caraway flavors, both of which are included in this month’s sales flyer. These probiotic concoctions, made with fermented organic vegetables, will enliven your day with a burst of tangy flavor while improving your gut health, which research has shown has an incredible impact on your digestion, skin health, emotional well-being, and issues such as Irritable Bowel Syndrome. So what do you do, eat, and drink that helps you stay on top of your game every day? Tell us about your trials and triumphs by commenting, and we'll all continue to grow together!